Join us Sunday, May 14, from 11 – 5pm (get your reservations in now for group of 10 or more… they’re going fast!). For Mom we’ve got free flowers, free chair massage, free dessert, AND a $10 gift card for their next visit to help celebrate 10 years in business! We’ll have wagon rides through the vineyard and entertainment by local favorites, Colleen Raye and family, on Sunday for all to enjoy! As we near the start of our 2017 season we’ll be looking for some new faces to join the Vino in the Valley family. 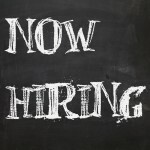 We’re seeking candidates for all positions, including dishwashers, runners/bussers, hostess, front desk and gift shop, who are enthusiastic and service-oriented. If you’re interested in joining our staff and working in a fun environment, please download an application here. We will be setting up interviews starting at 8am on Saturday, March 25, 2017 at Vino in the Valley. And please, spread the word to friends and family you may know who are looking for a close-knit work family and rewarding food-service career. 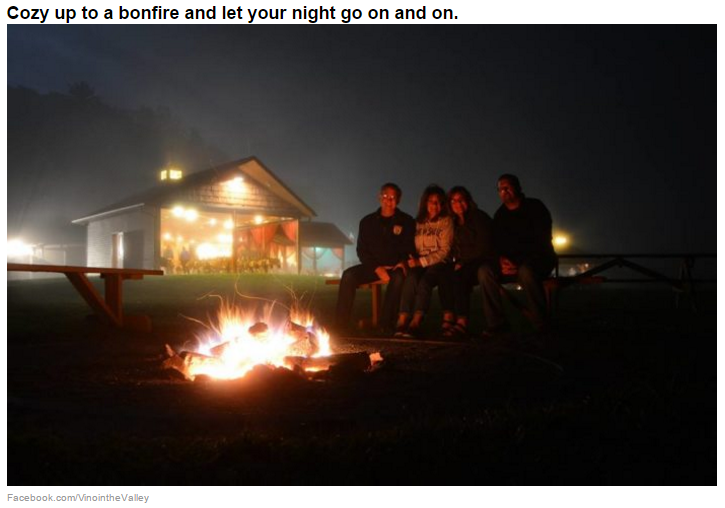 For those of you new to the ‘Only in your State’ website, it’s a network of state pages that help its visitors discover new and exciting things to do in their own state or across the country. 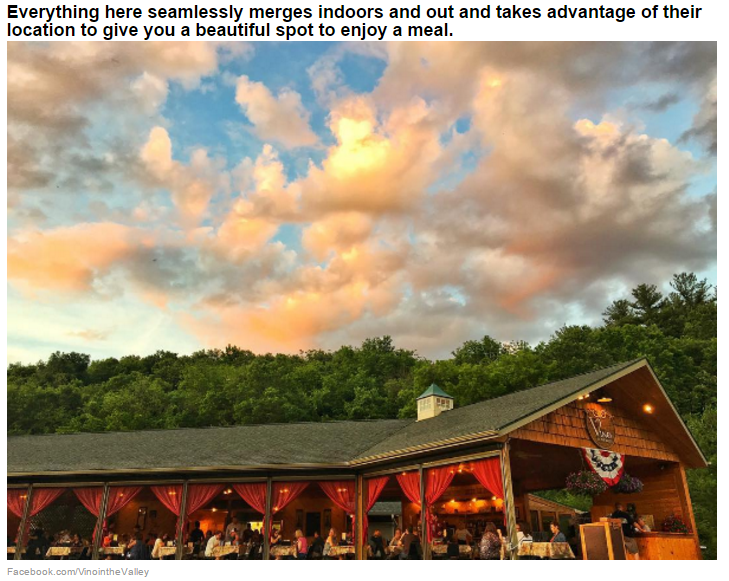 Vino in the Valley appearing on the Wisconsin page is nothing new, we’ve appeared in several “top 10” articles such as, These 10 Little Known Restaurants In Wisconsin Are Hard To Find But Worth The Search, Try These 10 Wisconsin Restaurants For A Magical Outdoor Dining Experience, and 10 Restaurants You Have To Visit In Wisconsin Before You Die. But we’ve never had a feature dedicated solely to us, and believe us when we say, this is a BIG deal! They posted the article to their Facebook page and the post received almost 1000 ‘shares’! We’re so happy they chose to spotlight this photo! And included a shout-out to our friends at Ellsworth Cooperative Creamery. 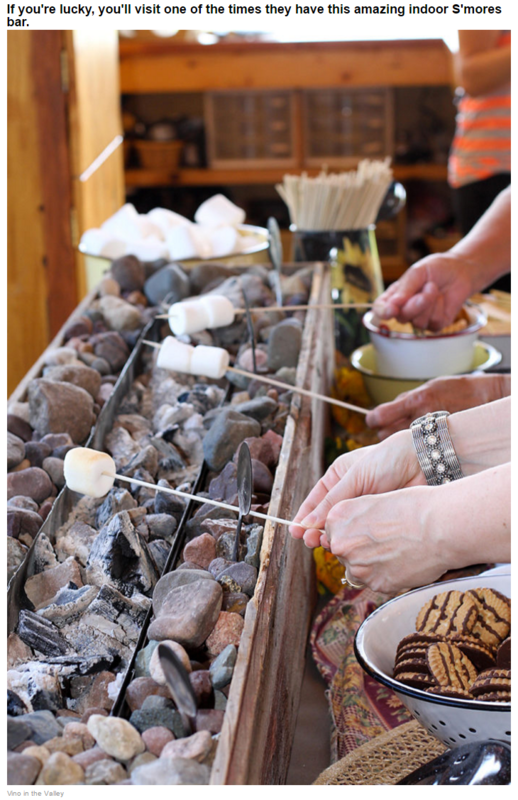 Reminded us that we need to do the S’mores Bar more often! And showed off how we like to wrap up our evenings around here. A great group of friends, a glass of wine, and a bonfire under the stars. Perfection. 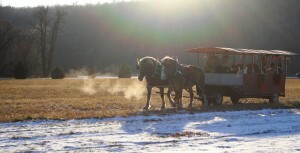 Unfortunately, due to the weather conditions, the horses will not be here for sleigh rides. 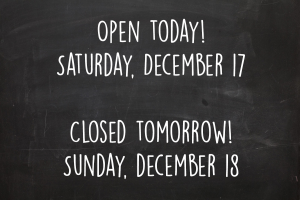 We’ll be open today, Saturday, December 17. 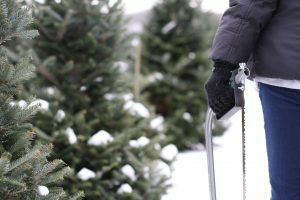 However, due to extreme winds and wind chill temperatures tomorrow, Sunday, December 18, we are going to be closed. Of course this weather is almost tropical for Santa and Mrs. Claus, so they will both be here today as planned, from 1-4pm. 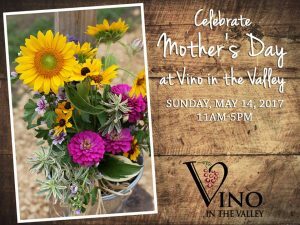 So that means today will be our last day of the season for us here at Vino in the Valley. Thank you for your continued loyalty and support through the many extreme weather conditions this year… from scorching heat, to severe weather and associated damage, to extreme cold, we’ve had a heck of a year! We’re now looking forward to a long winter’s nap… See you all in May of 2017! End of the Year Blow Out Sale! It’s time for our end of the year blow-out sale! It’s our way of clearing off the Gift Shop shelves to make way for new merchandise and wine for the 2017 season. Receive 20-50% off all Gift Shop merchandise. 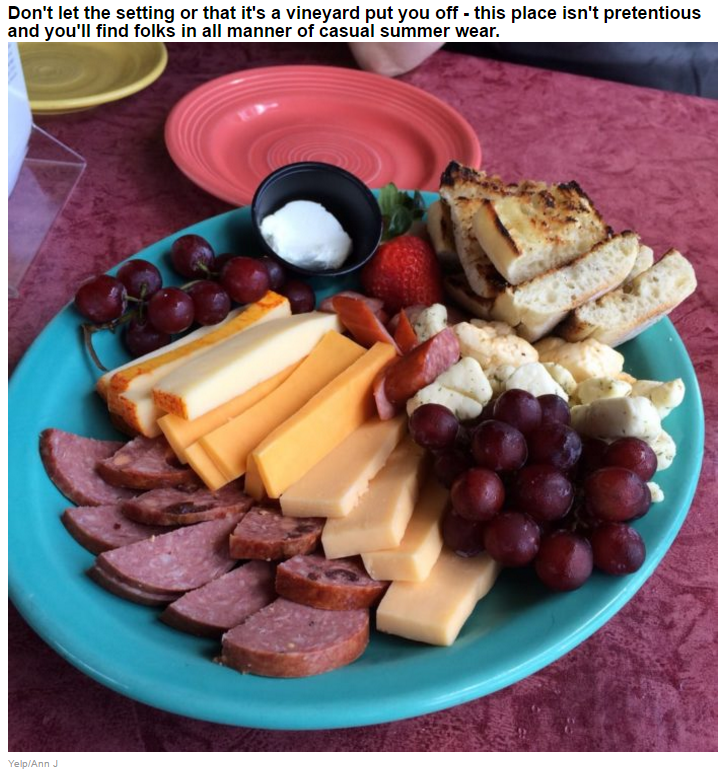 PLUS… Buy 2 bottles of wine, get 1 free! Wine discount good on all inventory offered in the Gift Shop! 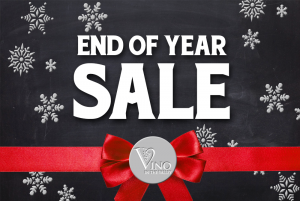 Now’s the time to stock up on your winter wine and holiday gift purchases! Visit the Vino in the Valley Gift Shop Saturdays & Sundays, December 10, 11, 17 and 18, 11am – 6pm. Vino In the Valley https://vinointhevalley.com/wp-content/uploads/2018/07/Vinointhevalleylogo.png Vino In the Valley2016-12-07 14:50:192018-09-18 16:19:00End of the Year Blow Out Sale! 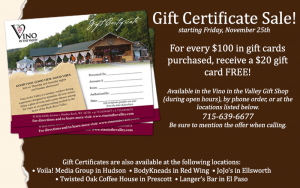 Vino in the Valley gift certificates make great gifts, and from now until December 24, 2016 when you purchase $100 in gift certificates you receive an additional $20 gift certificate FREE! Vino In the Valley https://vinointhevalley.com/wp-content/uploads/2018/07/Vinointhevalleylogo.png Vino In the Valley2016-12-01 13:51:052018-09-18 16:19:00The Biggest Gift Certificate Sale of the Year is Here! We’ve put the sides down on the pavilion for the festivities and our heaters keep things nice and warm. Enjoy sleigh or wagon rides around the vineyard, visit with Santa (Saturdays and Sundays from 1-4pm), or sit by the fire! We will be serving up our famous brick oven Pizzas and Italian Nachos. Oh, and how can we forget the wine? Yes, the wine will be flowing (as will the hot cocoa for the kids). And the kiddos will also have to check out our “Cookie Decoration Station”! • Order a large 14″ pizza and get a bottle of wine for 1/2 off! • 20% everything in the Gift Shop! All wine, clothing, jewelry, and more! 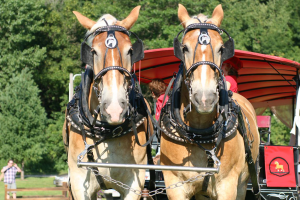 Horse Drawn Vineyard Tours Again This Weekend! Well folks, the last weekend for our 2016 regular season is upon us. But it’s going to be a great one! The Star Belgians will be making another rare fall appearance at Vino in the Valley this weekend – October 29-30! The mother and daughter team of Dahkota & Avalon will be taking our guests on a beautiful fall tour of our vineyard, along the Rush River and throughout our grounds, all at no charge. Plus, be sure to enjoy everything else Vino has to offer! We have a great line-up of entertainment; Don & Doreen on Saturday and Tommy Bentz on Sunday. We’ll be serving up our full menu on Saturday and our famous buffet on Sunday (brick-oven specialties – pizzas and nachos – also available on Sunday). Bring the entire family and plan to spend a beautiful fall day of fun in the valley! Vino In the Valley https://vinointhevalley.com/wp-content/uploads/2018/07/Vinointhevalleylogo.png Vino In the Valley2016-10-27 13:17:082018-09-18 16:19:01Horse Drawn Vineyard Tours Again This Weekend! 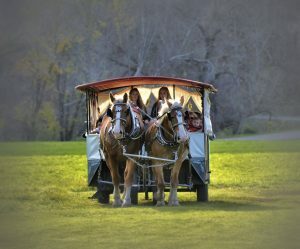 Horse Drawn Vineyard Tours this Weekend! The Star Belgians will be making a rare fall weekend appearance at Vino in the Valley this weekend – October 22-23! Plus, be sure to enjoy everything else Vino has to offer! We have a great line-up of entertainment; Stacie, Russ, and Steve on Saturday and Mare Lennon on Sunday. We’ll be serving up our full menu on Saturday and our famous buffet on Sunday (brick-oven specialties – pizzas and nachos – also available on Sunday). Vino In the Valley https://vinointhevalley.com/wp-content/uploads/2018/07/Vinointhevalleylogo.png Vino In the Valley2016-10-19 15:07:062018-09-18 16:19:01Horse Drawn Vineyard Tours this Weekend! We would like to extend a formal invitation to you and your friends to join us for our upcoming customer appreciation day! 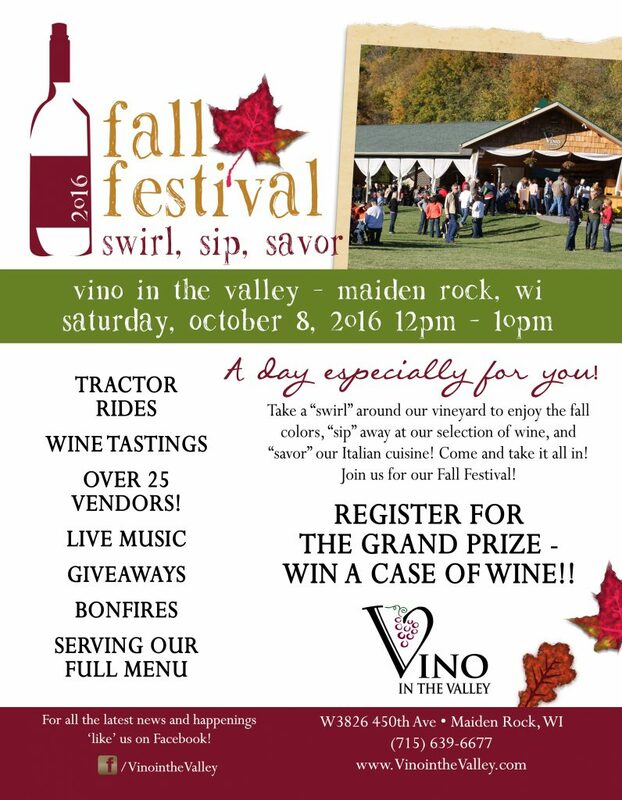 Join us Saturday, October 8, for Fall Festival: Swirl, Sip, Savor! We’ve planned a big event for you this year, full of activities, food, artisan vendors, and giveaways! And best of all, it’s dedicated to you – our customers.